Not long ago the U.S. Senate refused to accept an amendment to the stimulus bill by Sen. Jim DeMint (R-S.C.) that would have reformed some CPSIA provisions and delayed the implementation of others. Last night it rejected a similar DeMint effort in the form of a budget amendment, and this time there was a roll call, which confirmed that the rejection was largely along party lines: every Democrat voted against the measure except for Sens. Mark Begich (Alaska), Kay Hagan (N.C.), Amy Klobuchar (Minn.), and Ben Nelson (Neb. ), while every Republican voted in favor except Susan Collins (Maine), John Cornyn (Tex. ), Mike Johanns (Neb. ), Mel Martinez (Fla.), and John McCain (Ariz.). Independent Bernie Sanders (Vt.) voted against, while Sens. Robert Byrd (D-W.Va.) and Edward Kennedy (D-Mass.) did not vote. Following Wednesday’s rally on Capitol Hill, small business people who fanned out to visit their Senators brought back many encouraging-sounding stories of the favorable “We hear you!” “We get it!” reactions they had received visiting the offices of Democratic Senators like Roland Burris (Ill.), Joseph Lieberman (Conn.), Jeff Merkley (Ore.), Jay Rockefeller (W.Va.), and Charles Schumer (N.Y.). Whether or not anyone in those offices hears or gets the outcry, it sounds as if the members even more clearly hear and get a different message: that of party discipline. The WSJ editorializes on the law again today, its third, concentrating this time on the youth motorcycle/ATV ban. More: Montana senators fiddle while small businesses perish (Mark Riffey, Flathead Beacon); the rally and the Democrats (Rick Woldenberg). 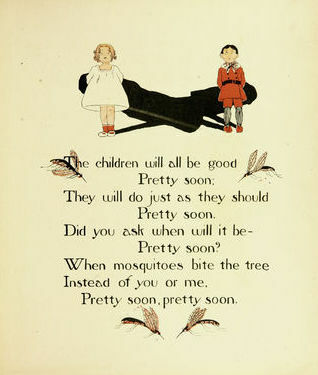 Public domain image: Yankee Mother Goose (1902), illustrator Ella S. Brison, courtesy ChildrensLibrary.org. It should be noted that MN only has one seated senator right now. There was a tweet asking about the “missing” senator. Landrieu was a no brainer. EYEROLL. At least with Vitter, there’s some hope, regardless of past acts. Well, what exactly does this mean for the bill passing or not? It means, I imgaine, that with enough pestering it can go through later! I guess this is “the change you can believe in” that everyone voted for last November. I guess that the change voters wanted was a bigger, more arrogant and unresponsive government than they already had. I knew John McCain was an instinctive regulator. I was surprise to see he voted no as well since he serves on the Indian Affairs Committee and I assumed the Native stance on the “cultural genocide” aspect of the CPSIA would have prompted a favorable vote. I considered it, but for the above reason he was one I chose not to contact. He is now added to my letter writing list. Thanks for reminding me to add a John McCain tag to this post. An anomaly in Congressional voting should be noted: the leadership sometimes assigns one loyal member to vote the “other” way for purely tactical reasons (only a member who voted on the prevailing side can file a motion for reconsideration). I do not know whether this might explain anyone’s vote in this case, whether for or against.